One might think that a review of the movie The Man Who Invented Christmas would be about the Christmas holiday, but one would be incorrect in their assumption. Certainly Christmas plays a part in the story, but it really isn't the main gist of this wonderful movie that I am about to recommend that you watch. I hazard to guess that if you have not read the book A Christmas Carol; you have at least seen one of the many movie renditions of the the tale by Charles Dickens. The story became an instant success when it was first published on December 19, 1843. It remains after 175 years to be a favorite of many adults and children a like. The premise of this movie is about how Charles Dickens wrote the novella, his struggles and a snippet of his life in the early years of the Victorian era. Charles was trying to cope with dwindling finances after having written three flops in a row (at least they were flops then but are not looked at that way now). In 1843, he had already had success with The Pickwick Papers and Oliver Twist. He had toured the United States and Canada; he was an international success. He needed to write something new and one that would be well received. The trouble was he did not have a clue what that story might be. Dan Stevens, of Downton Abbey fame, plays the young Dickens superbly! Christopher Plummer haunts Dickens as the character of Ebenezer Scrooge and Jonathan Pryce portrays the father of Charles who can be most infuriating to his son. The set designs, costume designs and cast of characters are magnificent. All of these combined make this movie a treasure to watch. What I loved the most about this movie was how the author is portrayed in the writing process of his much needed prose. I think that anyone who has tried to write a short story, novella, novel or play can identify with the inner battle a writer has while trying to form the story in his or her head and then to transfer those ideas to paper or the keyboard. 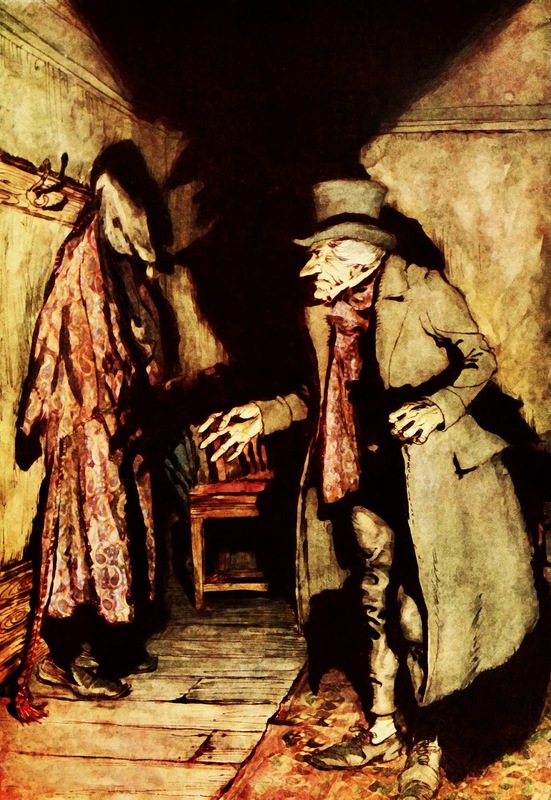 The story shows how Dickens needed to name Scrooge before he could come to life in his head and the story could begin to form. Once Scrooge was alive in his mind; Ebenezer would haunt the author in his office and around London. There were times that Dickens small office was crowded with the characters (seen only by Dickens) arguing points of the story. It is a process that I think any writer of fiction can identify with. I know my characters follow me around as I write and sometimes even wake me up telling me that I need to add something before I forget it. I thoroughly enjoyed this movie and highly recommend it to you all. Actually, I think that I want to watch it again. Oh, who am I kidding? I don't think, I know I want to watch it again. I enjoyed it that much! Now, if you will excuse me one of my characters is insisting that I re-write a scene because she says that I have made her say something that she wouldn't say. I think I just heard Scrooge shout, "Bah, Humbug!"